Youth are increasingly spending a lot of time on online social media sites, which many say is leading to a generation of “slacktivists”. This infographic takes a deeper look into youth on social media, and the arguments on whether slacktivism is a bad thing, or just a new way for youth engagement. Preparing this infographic, I dug deeper into the notion of slacktivists being enabled through the increase use of social media. The real question for me became; is slacktivism really something to frown upon? Or is it something to embrace? Throughout my research I was trying to decide which side I was on, and it made me reflect on the way I engage with social media. I feel that I personally fall into the category of a slacktivist. I often “like” causes on Facebook without doing anything tangible, I share upseting stories without actively reacting to them, and I watch motivating youtube videos but I never donate money. I realized despite my clicks, I am not making a noticeable change in the world. The thought alone was disappointing – that I was a slacktivist, concious that there is more I could be doing to improve my community engagement. Soon I told myself that I am a broke student, and I don’t have the time or means to be actively involved with all of the interesting causes I could be supporting. I care about the things I see; is liking a page on Facebook, or Tweeting about a cause insignificant? Will it remind me to give back in more tangible ways when I have the time and money to do so? Through this self-reflection I decided that being a slacktivist can be both good and bad. Bad in the way that produces “fads” with trending news and topics that momentarily become the thing to talk about before the next trend sets. Slacktivism is also an obscure link between the physical and the digital world. Even if someone is politically engaged online, it does not necessarily mean they are more likely to vote or take affirmative action. On the other hand slacktivism also has the power to spread the word to the right people through the multiplier effect of social media. Perhaps then the real problem is in different types of people within the “slacktivist” community. If someone is sharing because they are gathering people for a protest, or raising awareness, then it could be positive slacktivism. Yet sharing for the sake of staying within the trends and doing so without investigating the topic further makes questionable the sincerity of those clicks. Even more interesting is that it doesn’t seem to matter what ‘kind’ of slacktivist you are. Spreading the word will eventually get the information into the hands of the right people who will stand up for change. What do you think social media is doing to our social engagement? How can we make the best of it? – Krisitine is an industrial design student at Carleton University. 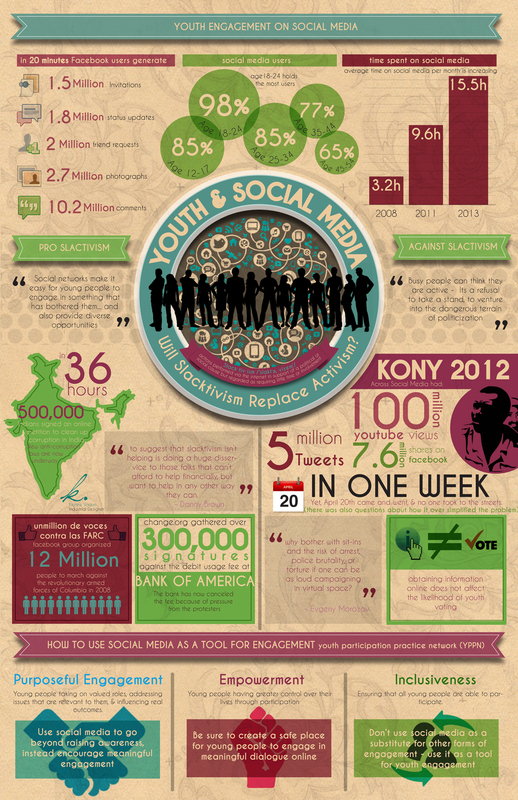 She prepared this infographic as part of the final assignment for a Recrear-inspired course on ‘Youth Engagement in Community Development’ taught at Carleton University in the fall of 2013.